Home »Transportation»Transit»The Road is CLOSED. On Monday, June 2, 2014 road closure signs were placed on 35th Ave NE at NE 107th Street. There is no through traffic, and access to the Meadowbrook swimming pool and community center is possible only northbound, a little past NE 105th Street. Work has commenced to improve the South Fork of Thornton Creek where it crosses under 35th Ave NE, as a flood control and environmental improvement project. The Confluence Project, now in its third and final year, will create more capacity to handle floodwaters and will improve the creek environment for fish. Engineering diagrams can be found on the project page. 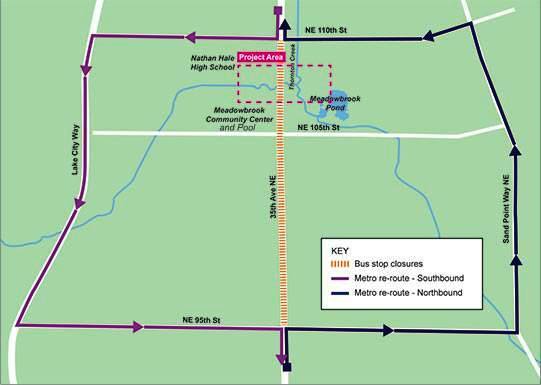 Bus routes 64 and 65 will travel along NE 95th and 110th Streets over to Lake City Way NE to detour around the road closure. For the next few months, if you travel to Lake City, including shopping trips to Fred Meyer, get in the habit of going via Lake City Way NE.